To demonstrate how easy it is to parse AIS messages (what is an AIS message?) 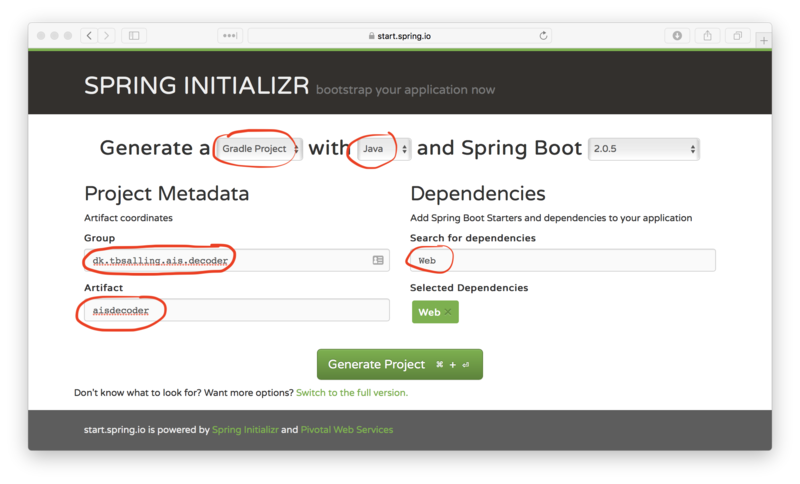 with my open source library AISmessages, this post shows how to create a Spring Boot based microservice which can receive NMEA strings via HTTP and respond with the decoded AIS messages in JSON format. All seems well. The Spring MVC web application is running - but not doing much useful yet. Next we will add the Spring MVC controller which handle incoming HTTP requests. This controller should be able to receive a JSON array of NMEA strings and output a JSON array of AIS messages. This class is discovered by Spring through classpath scanning at startup, and handles incoming HTTP POST requests headed for URI /decode - such as http://localhost:8080/decode. The current implementation is mostly boiler plate and does nothing useful. Then we need need the AisdecoderService. This is the most custom part of the code and where the real work happens. It should receive a list of n NMEA messages, convert and return these as a list of m AIS messages. So - how do we implement the decode method? The key here is class NMEAMessageHandler from AISmessages. NMEAMessageHandler is a class which can keep consuming NMEA messages and perform a callback whenever the received messages result in the successful decoding of a complete AIS message. Sometimes NMEA messages and AIS messages correspond 1:1 - other times it takes 2 NMEA messages to decode 1 AIS message. Now the decode()-method initializes a NMEAMessageHandler. This handler is handed this (the decoder itself) to that it can make callbacks whenever an AIS message is fully constructed. To be used for callbacks, the AisdecoderService needs to implement the Consumer<AISMessage> interface.